Curios and Dreams | Makeup and Beauty Product Reviews : Your Prayers are Answered! New Pantene Oil Replacement is HERE! Bringing us the power of nourishing oils in a creamy form, this newest launch by Pantene does away with the hassle of oiling. That means… no stickiness, no stained sheets/pillow-cases, no oil triggered acne. (Say yes to #TelKoTelLagao) It’s the perfect solution for the lazy bum, or indeed for a woman on the go, and I’ll tell you just why. First of all, can we all agree on the fact that oiling takes time? You need to gently warm up the oil, then apply it carefully so that you don’t spill, then massage it into your scalp. And forget about checking your phone, or using the remote to switch to your favourite show that you just remembered is already on! But Pantene’s here to put an end to our worries. A little bit of this luxurious non-sticky cream and 2 mins is all you need to pamper your hair with all the benefits of a good old oil champi, and then a little extra! It’s as easy as 1, 2, 3…! 1) Dispense a little bit of the cream on your palms, and rub to spread it. 2) Spread it evenly on your hair, from mid-length to the ends where the hair tends to be drier. 3) Comb through and TA-DAAAAAA…! Leave it at that, or style your hair for added oomph. Why I’ve been loving the Oil Replacement cream is that my schedule has left me with very little time to oil my hair, but I do not need to fret about my hair becoming dry or brittle this winter because I can apply this in a jiffy and know my hair is protected. 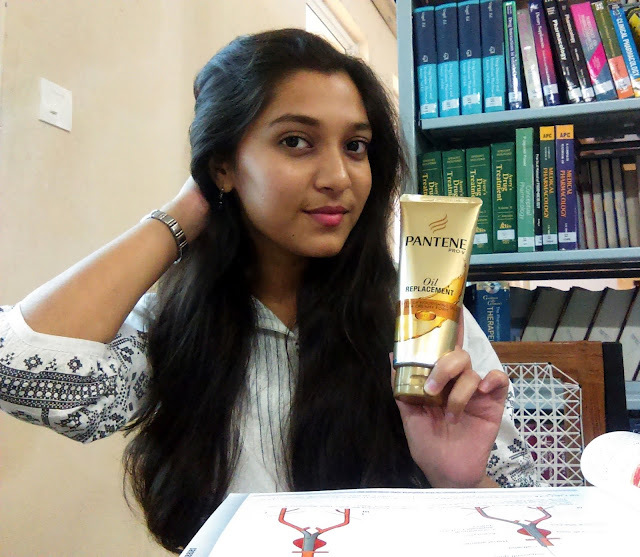 Incorporating its Pro-V science into the formula, Pantene promises to nourish your hair, improve its elasticity by repairing damage (2X stronger hair, people! ), and reduce hairfall due to breakage. And because we all love a good icing on the cake, this product also leaves the hair touchably soft, smooth, and so femininely fragrant! Now before you peg it as a plain leave in conditioner, let me tell you that it works just as well as an overnight treatment. I made one of my friends (who has tight curls FYI) try it, and OMG were those some smooth and defined curls post-shampoo! If curls can look that good, I want want want! Go get the hair you’ve always dreamed of!